Those straight-blade forks are ghastly, otherwise nice bikes. 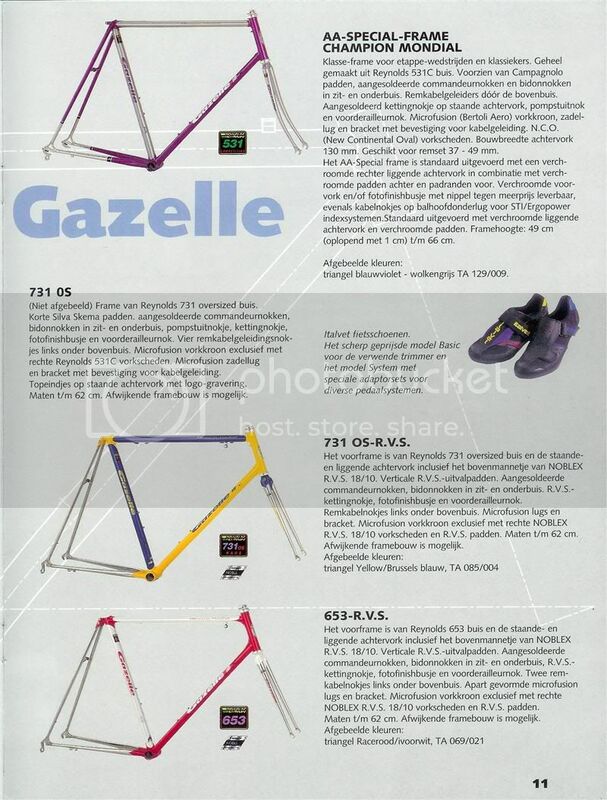 Ghastly you may think, but Gazelle must have thought: lets do what Colnago has been doing for a while! More interesting, the use of 'Noblex', or stainless steel in their frames. And what i consider a nice touch, the fastback seatstays! Thats more associated with the 70s than the 90s I'd say. I always think Gazelle was in their last efforts at making decent steel frames, and after those ones, they just gave up. Last edited by s70rguy; 08-09-08 at 04:44 PM. 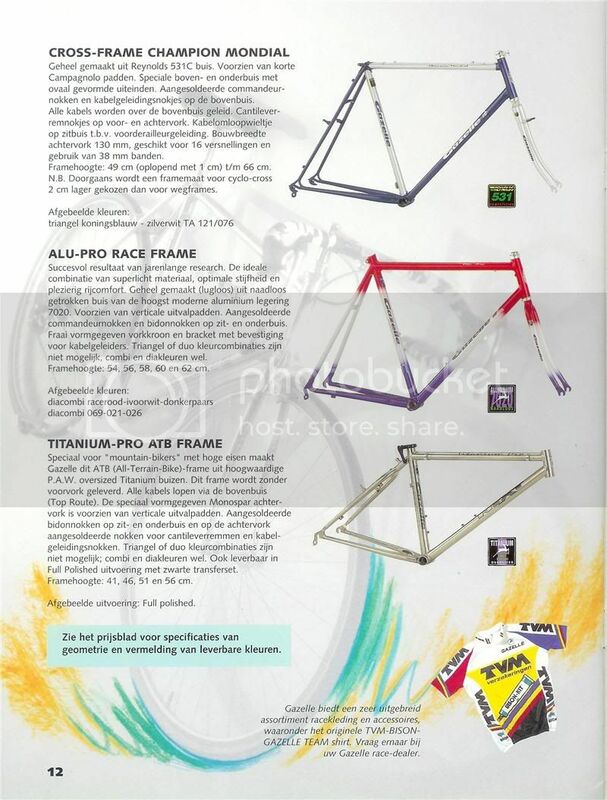 I would ride any one of those framesets without hesitation...straight fork blades or not. I think they all look great. 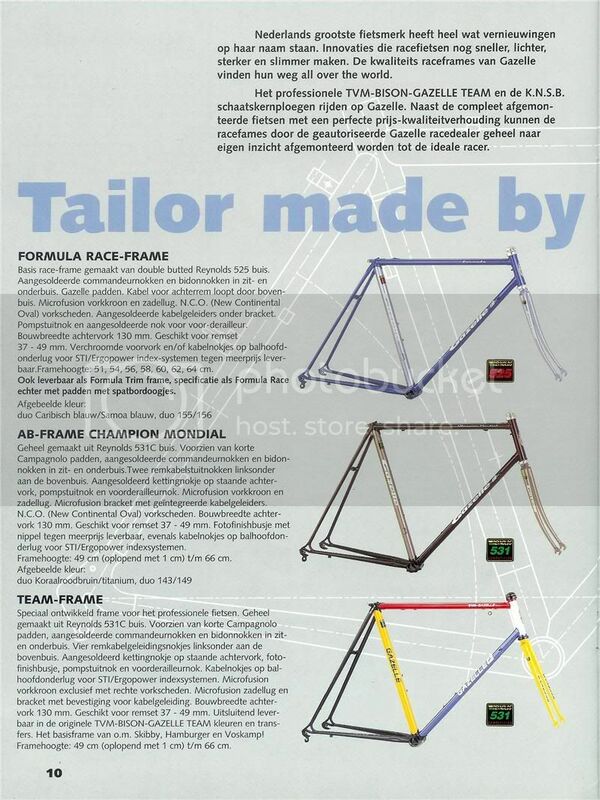 The Formula frame was the most economical, but still handmade in Dieren. The Champion Mondial AB was a slightly more economical and relaxed deriviate of the Champion Mondial AA frame. It is made out Reynolds 531C tubing. The Team frame was the TVM/Bison team specific frame. Brief on the CM AA: Reynolds 531C tubing, Campa dropouts, cable routing through tt, microfusion (Bertoli Aero) crown, lugs and bracket, chrome right chainstay and dropouts. Sizing from 49 to 66 cm with 1 increments. The 731OS was made with Reynolds 731 tubing and the addition RVS in 731OS-RVS denotes Poppe & Pothoff Noblex stainless steel forkblades and tail. The polished sections are stainless. Very nice. The 653-RVS uses Reynolds 653 with Noblex stainless steel blades and tail. Next page shows the cross edition of the Champion Mondial. The Alu-Pro uses welded 7020 aluminium tubing. I recall I have a review of the 731OS RVS somewhere. Tiny 'but': again in Dutch. Still fun for watching pictures maybe, so something for next scan session.